Neighbors Amanda Moran and Amelia Rudolph are involved with the world-famous Bandaloop vertical dance company, and they’re holding a fundraiser to support their (magnificently insane) new project. As part of that effort, you’re invited a glamorous downtown party that takes place on Friday evening, Dec. 5. Wanted to let you know about a very cool project Bandaloop is doing. 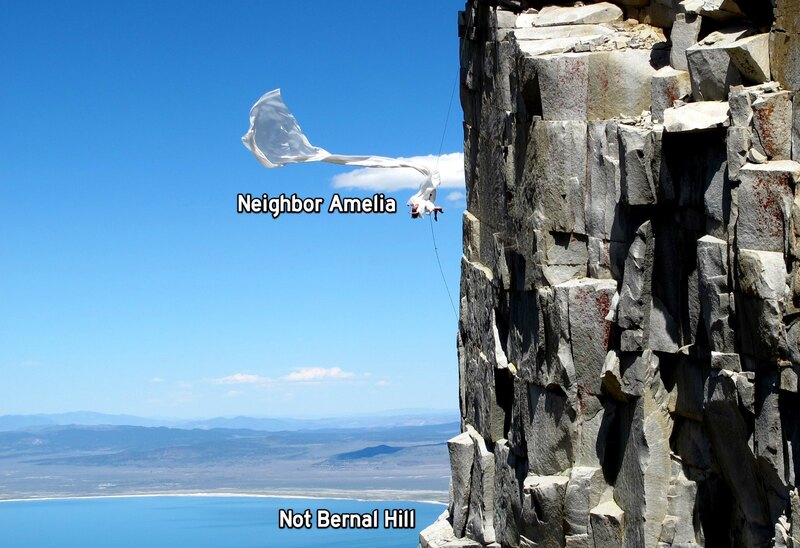 Bandaloop founder/artistic director Amelia Rudolph and myself are both Bernal residents. Bandaloop is the Bay Area’s premiere vertical dance company, and in 2015 we are re-mounting the seminal mountain work “Crossing” in the Sierra. We have seed funding from the National Endowment for the Arts, but we need to more than double it to build the piece. We started a RocketHub campaign and are about 30% funded, with a goal of $25,000 by 12/17/14. In a nutshell, the Bandaloop posse wants to re-shoot their much-admired vertical dance piece from 2001 to take advantage of a) a decade of dance technique refinement, and b) the advent of the GoPro Age. Through the creation of the “Crossing” performance on-site along the Sierra crest, and through the associated film, BANDALOOP will transport the aesthetic of dance created in nature back to the city, and bring this work to large and diverse audiences worldwide; both online and through live multimedia performance. The project will also include education modules for the classroom, addressing issues of environment and sustainability through the unique lens of BANDALOOP’s site-reactive dance. BANDALOOP is nearing the end of their fundraising campaign on Rockethub to raise $25,000 for “Crossing.” There is still time to donate and help them reach their goal! This Friday, December 5th, 6 – 8 pm @ The Hall, there will be an event associated with the RocketHub Campaign. Please come join! See you at The Hall! I’m personally more a fan of the horizontal dance. With the right moves, yes. I have been a fan of Bandaloop for many years. Amelia Rudolph is the founder and creative director of this wonderful group.